5 Tips to Avoid The Locksmith Scam? Locksmith Scam Videos, Links, and Resources. “After an evening out with her friends, Carol gets home and realizes her house keys are missing. She searches on her phone for a locksmith and calls the first company listed that claims $15 service calls. A man shows up in a t-shirt and a white car and after a few minutes playing with her lock, he says. "This lock cannot be picked open; it will have to be drilled." At this point, Carol just wants to get in her house and go to bed. He drills the lock open, replaces it, and hands Carol a bill for $350”, while in reality a licensed locksmith would have picked that lock in less than 5 minutes, and would have charge $65.00 to do it. Locksmith scams such as the one illustrated above have been going on for over a decade and have been well documented by the Federal Trade Commission and other consumer watchdogs. Although widely reported by local media across the country, most consumers are still unaware of the unethical practices of these fraudulent companies, many listing fictitious local addresses and phone numbers to further dupe the unassuming public, and more often than not the victims reporting this abuses are women. ASAP Lock & Safe has always been aware of this trend and we hope that the the study that we present is enough to bring attention to this issue as it is affecting the safety of woman on a daily basis. . The method used to gather the reports was to perform searches on Google, Bing, Yahoo, and YouTube for keywords in relation to the Locksmith Scam. Before including a report in the list we made sure there was not a duplicate. The reports were gathered from: Local and National TV stations websites, YouTube Videos, local online newspaper reports, and private online postings of victims, for a total of 43 Locksmith Scam reports. In 74% of the reports we surveyed the victim was a woman. Additionally, a good percentage, 12% of the reports, were re-enactments staged by news stations, although they are done by actors, they all show women as a victim and it can very well be that the ones originally denouncing the problem to the news outlets were women. If these were to be added the percentage of woman victims in the reports would rise to 86%. An additional 4% of the reports were about Ghost Businesses and Business Identity Theft, while in the remaining 9% of the reports the victim was a man. 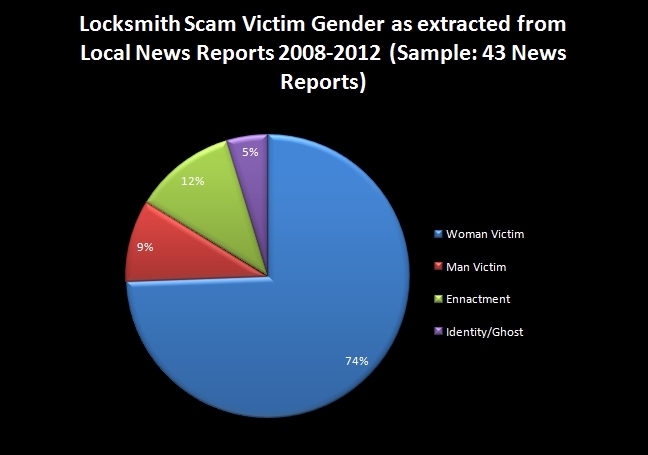 This data suggests that women are more likely to be victims of the Locksmith Scam than men. To which extent this is done with explicit intent it is not the subject of this report. We believe the size of the sample and the tendency is strong enough to bring this issue to the forefront. Out of 43 different reports spanning numerous cities and a period of 7 years, 32 had women as victims, representing a 74% of the total, and it’s possible the percentage could be higher. We believe this is an alarming number and it requires further study, education, and dissemination by local and national public safety authorities, woman’s safety organizations, and woman’s related websites. General Press Release, Click to Download. Pinterest Press Release, Click to Download. Español - Comunicado de Prensa, Haga Click Aqui. Llist of reports sampled for the study. Results and Conclusions, Click to Download. 1.- Save the phone number of a reputable locksmith in your phone. 2.- Share the phone number with family members. 3.- Make sure the Locksmith has a local shop. 4.- When you call corroborate they answer with the name of the company as advertisied, for example: "Good Morning, ASAP Locksmith How Can I Help You?, not a generic term like "Good Morning, Locksmith Services"
5.- Ask if they wear uniforms or identifiable service vehicles, and confirm it when they arrive. Locksmith Scam Videos, Links, & Resources. Komo News Locksmith Scam TV Report.